Click on Open as shown in the picture below. You will see a box that says opening file (this might take a couple of minutes). After it is finished downloading you will see the following screen. Simply enter your user information and click ok. 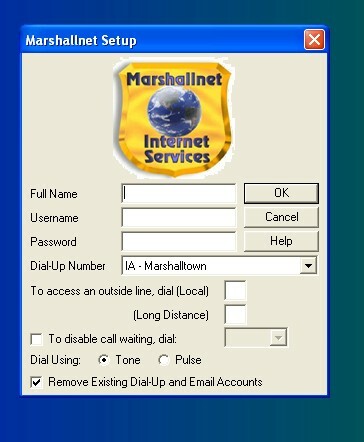 Enjoy Marshallnet's new Nation wide dial up. If you travel simply select the correct town and state from the dial up number box. Also, don't forget you can earn free months by referring you friends and family that live in these cities.